LAKEWOOD, Colo. – By the team behind The Wooden Table in Greenwood Village comes Brodo Scratch Kitchen, a hip yet accessible dining destination coming soon to Lakewood’s Belmar shopping center. In a neighborhood filled with familiar fast-casual options, Brodo aims to offer something new: elevated yet accessible Italian cuisine in an inviting, modern atmosphere. A nouveau twist on traditional Italian dining, Brodo will bring good friends, great food and warmth to the soul. 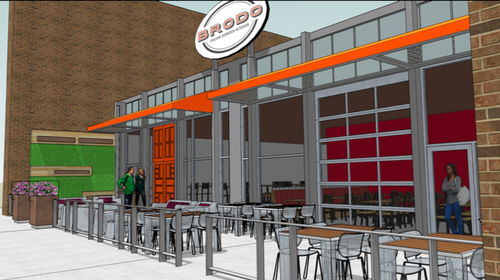 Brodo’s menu will be comprised of unique appetizers, simple and entrée-sized salads, grinder-style sandwiches, housemade pastas, entrées and desserts. The same menu will be available at lunch and dinner, and the restaurant also has plans to introduce a daily happy hour with discounted appetizers and drinks. The full-service bar will, meanwhile, offer a variety of Colorado craft beer, wine (including house keg wines and even a house Prosecco on tap) and specialty craft cocktails. Following in the footsteps of Sk Restaurant Concepts’ successful flagship restaurant, The Wooden Table, Brodo’s approach to Italian-influenced cuisine is fresh and simple. Every dish is built to showcase quality and care, and the restaurant’s décor displays a similar attention to detail. Rustic, natural elements like wood and concrete are complemented by a neutral color palate and pops of warm tones.